Somewhere along the way this started. "Just wait until 4 months, you'll never sleep again"
"Actually, when he hits 1 is when your life is REALLY over"
"Ugh, you are fine, 2 is the worst age. You'll see." That was when I realized instead of enjoying watching Reuben grow and learn, here I was thinking I should be dreading his next milestone. Because in actuality I honestly have been enjoying myself lately. And feeling like something was wrong with me, because I wasn't unhappily complaining about how hard everything is like every other mom. Yes. I am, actually, honestly, having fun! I love watching Reuben grow. Is my life over? Nope. Is Reuben horrible? Nope. Do I sleep? Yep. I mean, parenthood is hard just like most of life--but its rewarding. It's interesting. It's wonderful. I love it. I found out I love parenthood. I love spending most of my day with Reuben. In my opinion, every age and milestone my son hits makes my life better, not worse. Since he's turned one he's been just the same awesome little person that he was at 11 months, BUT more independent and more vocal. It's a win/win for me. I mean, yes, I struggle sometimes. But it's not the depths of despair. It's not the end of the world. It's a temporary setback while we deal with Reuben being a little boy with 100% human feelings but the body of a child. It's not an inconvenience to my life. It's a teachable moment, a moment I can give to my son to show him how much I love him and to teach him how to handle himself. It's temporary. And the things he teaches me! I could go into paragraphs and paragraphs. He teaches me to see the mystery in the small things, the wonder in the world I'd forgotten existed in the humdrum. He teaches me that snuggles with mommy really are the best thing in the world. He teaches me what it's like to see a plant for the first time. And to see the world for the first time. I have a new awe of God--for giving me this little boy to nurse, to nurture, and to grow with. I'm excited about Reuben turning two. I'm excited about him turning three. I don't live in fear any more of my life being over. My life is Reuben and Daddy and knitting and brownies at 7pm because chocolate. And that's okay. It feels right. I feel such a peace about it. I didn't realize I thought it would be such an ordeal! 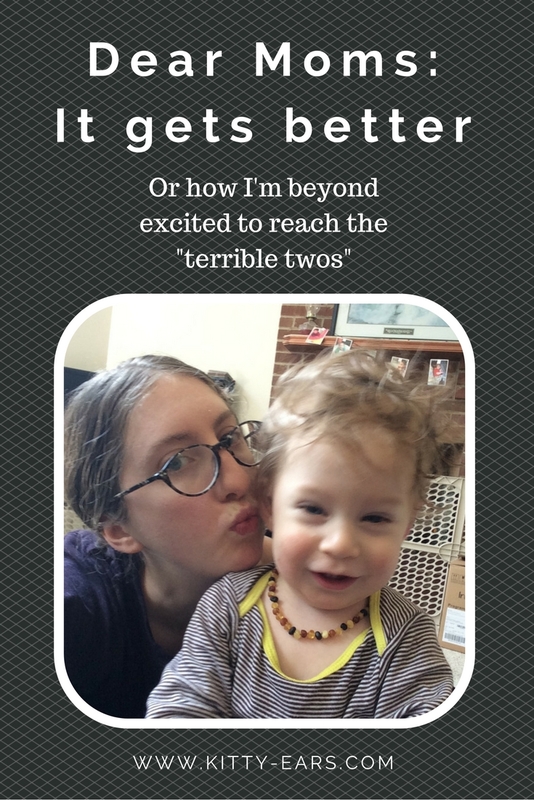 But I've found, surprisingly--that it gets better, not worse, as my little human grows. And that is what I am going to tell other moms. It gets better, not worse. So enjoy it while you can because it's all uphill from here!